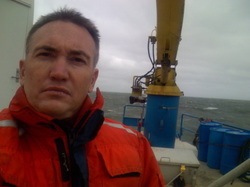 In 1993 I started my company, Discoverer Scientific Charters. Headquartered in the bell tower of the old church we bought in Key West, Florida. The goal was To Provide Personnel, Logistical, and Vessel Support to Scientific Expeditions World Wide. 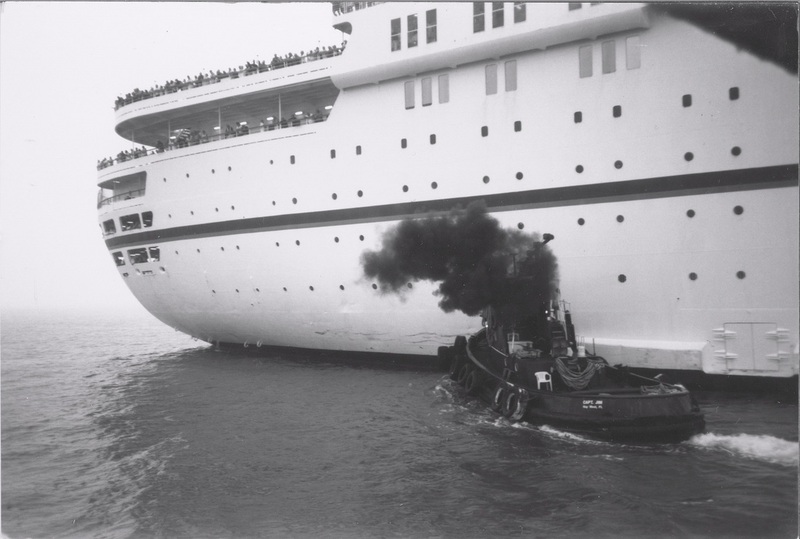 For quite a few years the "Vessel Support" meant other peoples boats. But a persistent vision continually invaded my head and worked its way into my notes scribbles, and plans. But all this time I had a vision stuck in my head that I couldn't shake loose. My own small research vessel, with an international crew of young adventurers, sailing from one fascinating scientific research project to the next, and sharing the excitement of exploration on the sea. She would be the flagship of Discoverer Scientific Charters. exploration vessel when I was 13. It was a canoe. 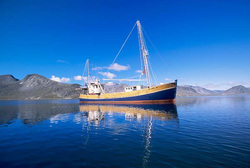 I went to sea at 17 as part of the Alaskan Fishing Fleet. Andrea Bosshardt took this picture off Boca Grande. 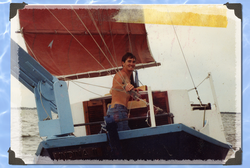 Probably the most fun I ever had on a boat was with my Junk Rigged St Pierre Dory, Undina. I single-handed around the 10,000 islands and the Florida Keys for years with her. Thats how I came to call Key West my home port. Key West is a great sailing town, covering a tiny island in the middle of the sea. I met Teresa there ( she was sailing too), and continued to voyage whenever I could. Along with other jobs, I went to sea as often on other peoples boats, sailing to the Carribean, Galapagos, South Pacific, and the Mediteranean. 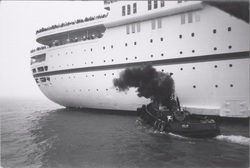 "Tug Jim, Push Full on Port Quarter!" During this time I worked my way up as a professional mariner, "Crawled up through the Hawse Pipe" is how they call it, attending the Maritime Academy for upgrades and working as a licensed mate and then eventually Captain on many odd vessel types around the Port and offshore, including Salvage Boats and Tugboats. Shipwreck Salvage is a great way to learn What-Not-To-Do on boats. And to take the helm of an old tugboat is every Mariners dream. Here's a story I wrote about working my way up from Deck hand To Captain of Tugboats. But all this time I had a vision stuck in my head that I couldnt shake loose. My own small research vessel, with an international crew of young adventurers, sailing from one fascinating scientific research project to the next, and sharing the excitment of exploration on the sea. 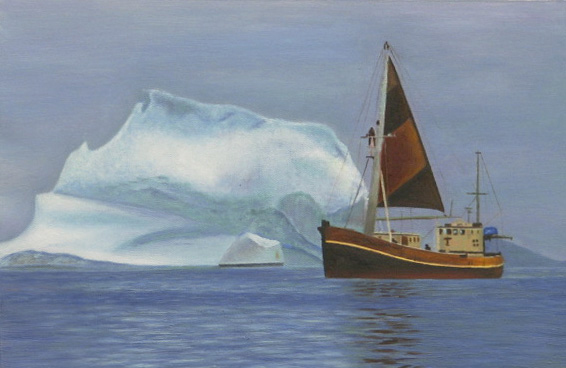 She would be the flagship of Discoverer Scientific Charters. I filled countless notebooks with plans, sketches, schematics, and letters, and spent restless nights with wild visions of the possibilities in my head. discovery, as well as telling a good story about it. And then one day, while leafing through "Boats and Harbors" I saw her, the same ship I was planning in my head and in my sketches. 4 months later Captain Hamilton Carter and I held a change of command ceremony at the Fisheries Museum of the Atlantic in Lunenburg, Nova Scotia, and her helm was mine. After 8 years of voyaging, this portion of the adventure had to come to an end. The economy tanked, research voyage jobs became scarce, and maintenance bills loomed large... I had to put her up for sale, and hope that the new owners would continue to treat her well. In January of 2009 she was no longer mine. But plenty of opportunity for adventure existed, and as soon as she sold I went to work as a research vessel captain and scientific diver for Aqua Survey, Inc., and continued archaeological diving on Sunken Egyptian Cities with Franck Goddio. 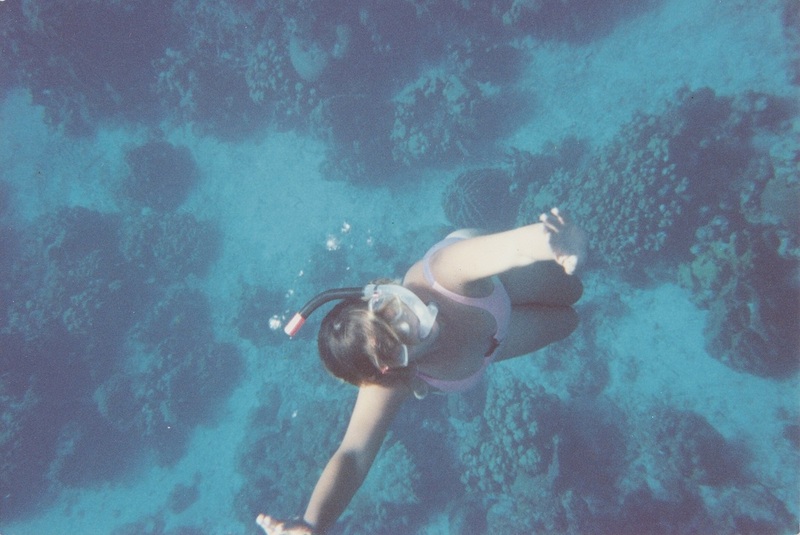 But as a sailor at heart, it is hard to keep the idea of a vessel of my own from creeping back into my head. And sometimes while I sleep, and sometimes during dinner, or when I am offshore gazing at the swell, my mind will wander far out to sea to another possibility, for another research platform project, even bigger than the one before.